hy has the idea of the Sublime, that the human imagination is moved to both horror and awe by its encounter with the vast and infinite, lasted so long and meant so much? In his Inquiry into it all in 1757 Edmund Burke gives us part of the answer: the Sublime deals with human vision in both senses of the word. First, what fills our field of vision from side to side and top to bottom affects our nerves and gives amazement, whether it is a full sports stadium, the ocean or the night sky. But the Sublime has to do with mental vision too, glimpses of the future, epiphanies, grand ideas. Even now, in a world where many do not feel a higher power is present, pictures present themselves to the eye and mind that make one amazed to such an extent that for a moment one’s thoughts are stilled with awe. This is illustrated in a show mounted in 2010 at Tate London of how paintings of different eras in modern Western culture pictured the Sublime, as well as in George Landow’s survey of the Sublime in his book on Ruskin’s nineteenth century aesthetics. Both sources show that, in art, as much as things change they stay the same. It turns out it does not matter what world-view predominates, the religious or the scientific, or what fills our field of sight, the ocean or a photomicrograph of a cell dividing, there is a similarity in all awe. Over centuries in England for example, theologians, Romantics and scientists, three groups often antagonistic to one another, have each loved the Sublime in their own way. Landow looks back to the influence on Ruskin of an earlier era when religion held a more prominent place in Europe. 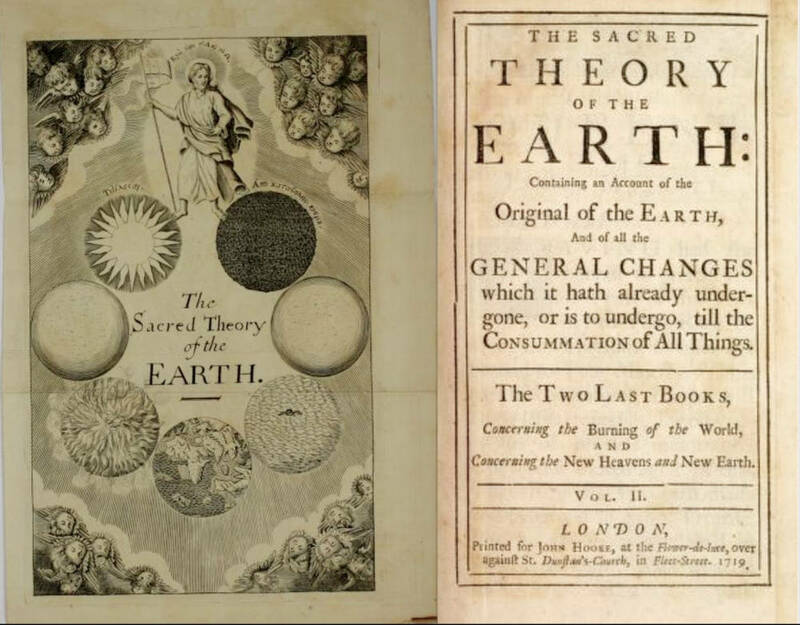 In 1681 a theologian named Thomas Burnet offered a theory that showed how the look of Earth changed as God’s relation to man changed. In his Sacred Theory of the Earth Burnet said God had created a perfect Earth but the punishment of the Flood gave the planet its current rough, irregular and asymmetrical terrain. 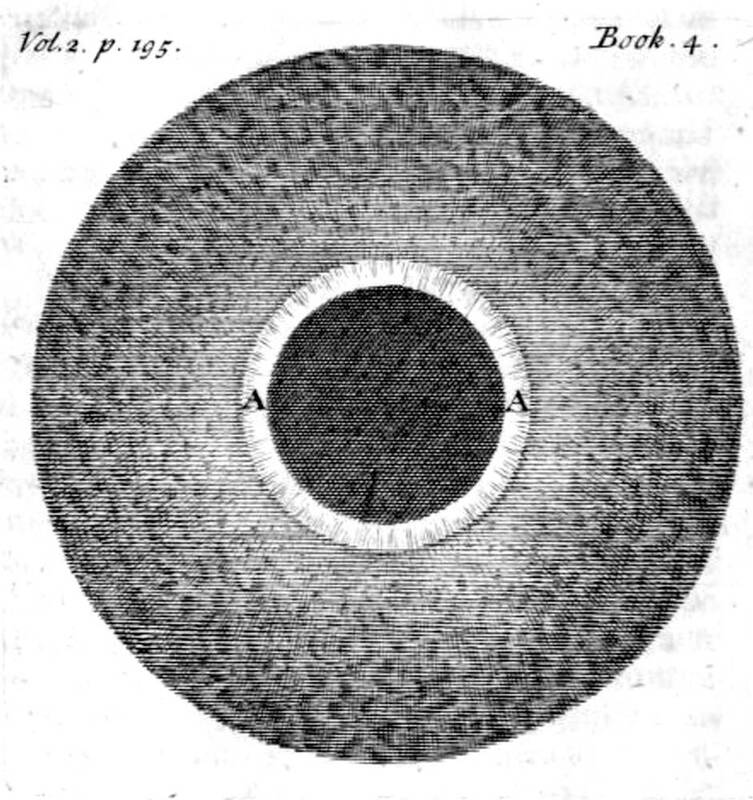 Burnet’s contribution to aesthetics is that he draws a word-picture of the pure Earth before the Flood with "not a Wrinkle, Scar or Fracture in all its body” (quoted in Landow) then follows this with another picture of the planet after the “fatal blow” which displaced land, formed mountains and moved Earth into its current form. Here we see that contrast of perfection and reality that threads through Western thinking. As illustrations, the theologian included engravings of God’s transformations of Earth--literally world-views that chart the planet’s descent from perfection. But speeding ahead to our own times, they can also be seen as representing natural changes in Earth’s crust which scientists say have been going on for 4.64 billion years. Thus, pictures of how an angry God destroyed the human habitat can also illustrate the scientific view of the ever-changing surface of that habitat. 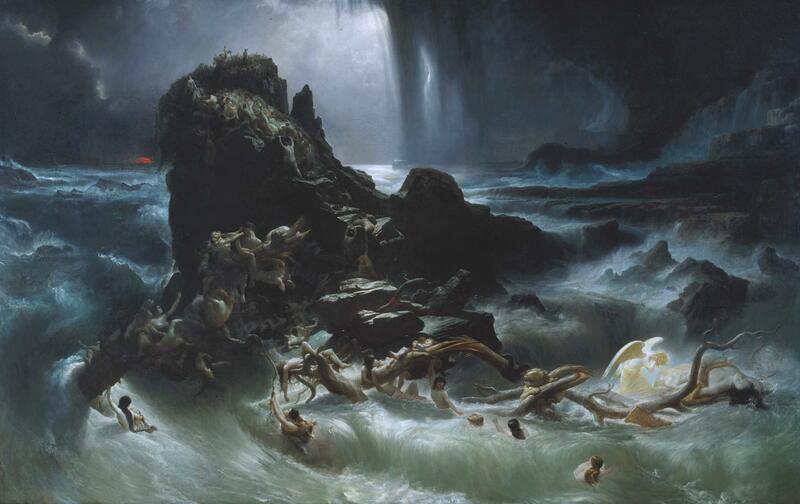 Burnet’s flooded Earth is our first illustration of the Sublime. This appears on the cover in the 5 o'clock position. All-encompassing waves, Noah’s Ark and the continents sketched beneath express an enormous situation which can have several meanings: man’s relation to God, planetary change or even a modern feeling of homelessness. In this way the Sublime, an image of amazing immensity, acts as a bridge between eras. Burnet said he was showing when God reformed Earth, and mountains and deep chasmed seas replaced the original smoothness. But we also see natural change: sedimentation, erosion, eruptions. Indeed, a hundred years after Burnet, geologist James Hutton published his own Theory of the Earth explaining Earth as a natural thing formed by the same processes in operation now-- the geological theory known as uniformitarianism. Hutton’s new idea pleased scientists, but was it so different than the pleasure of the sacred theory? They both conferred order on a vast process. Burnet’s engraving expresses a totality that can inspire awe in both theologians and geologists. By the end of the eighteenth century believers and natural scientists debated the reasons for changes on Earth, how much time had gone by and the presence or absence of God, but both their “Earths” experienced astounding upheaval so the Sublime, mysterious and obscure, threads through. First it was the cruel blow of the deity and now it is natural, but both generate huge pictures. Landow calls Burnet a “paradoxical man,” for the old theologian’s thoughts illustrate a tricky Western balancing act. Though he mourned the loss of Earth’s symmetry and perfection he wrote that he was also attracted to Europe’s dramatic, asymmetrical sea and mountain vistas, the ones Hutton would soon explain geologically. Theology and science cross paths here and this opened the way for the Romantics’ sublime landscapes expressed in painting and poetry that celebrated man’s closeness to God but emphasized that awe and wonder arise from within man. M. H. Abrams, the scholar of Romanticism, captures the connection of religion and science in his phrase, natural supernaturalism. Philipe de Loutherbourg’s Avalanche in the Alps of 1803 below is filled from top to bottom and side to side by awesome geological formations accentuated by small figures. But his idea of a cataclysm echoes the idea of Burnet’s flooded planet. In both works there is nothing to distract our eye from the artist’s vision of grand crisis and danger, and this is the Sublime. 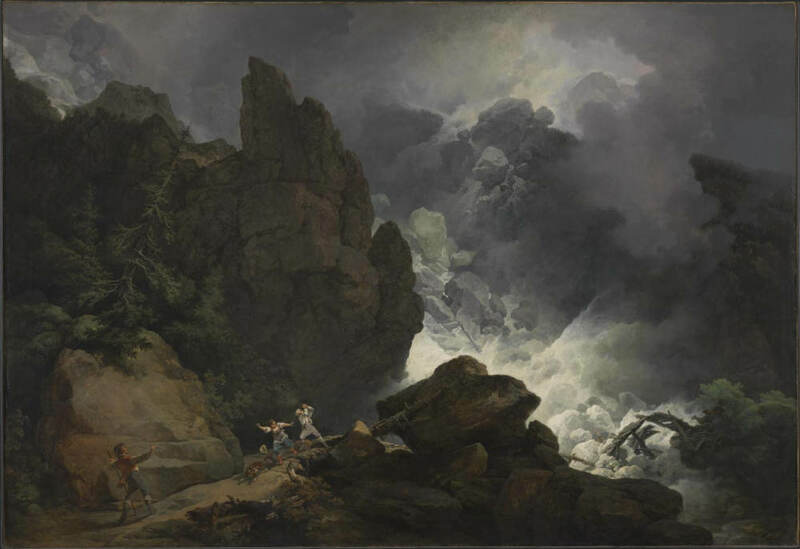 An Avalanche in the Alps by Philip James de Loutherbourg (1740-1812). 1803. Oil on canvas, 1099 x 1600 mm. Accession number: T00772. Presented by the Friends of the Tate Gallery 1965. Click on image to enlarge it. Salisbury Cathedral from the Meadows by John Constable. Oil on canvas, 1800 x 2187 x 105 mm. Courtesy of Tate Britain Accession no. T13896. (Purchased by Tate with assistance from the National Lottery through the Heritage Lottery Fund, The Manton Foundation, the Art Fund (with a contribution from the Wolfson Foundation) and Tate Members in partnership with Amgueddfa Cymru-National Museum Wales, Colchester and Ipswich Museums Service, National Galleries of Scotland, and The Salisbury Museum 2013). Click on image to enlarge it. 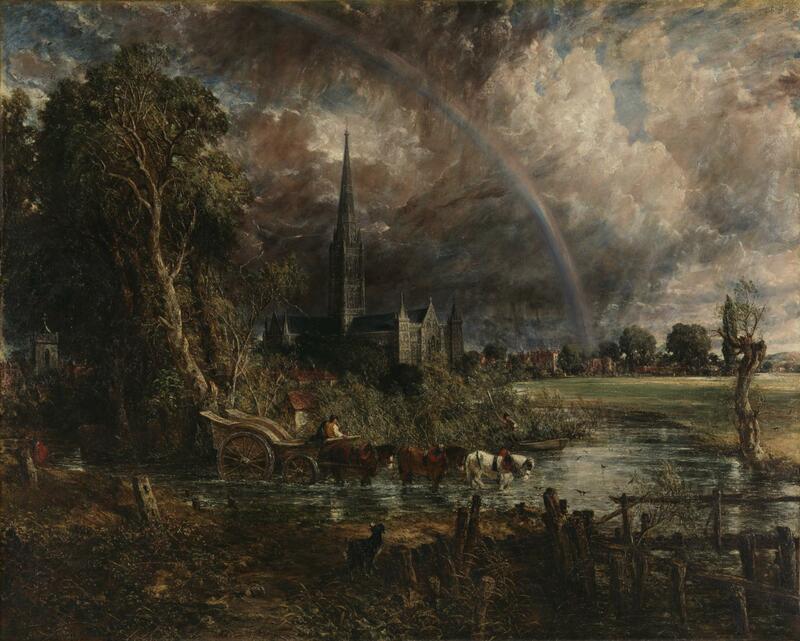 Constable’s clouds, dark, active, passionate, are in contrast to the sunlight of the foreground. The church spire and its protective rainbow are centered between two trees transformed by time. To bring this home, cover the sunlit bottom half and you will see the church scene as simply gothic, claustrophobic, negative; but open yourself to the whole, allow in the sun and the feeling widens towards sublimity: God, nature and man. The chief philosopher of the Sublime, Edmund Burke in 1757, favored this aesthetic idea over Beauty because, he said, astonishment, obscurity and vastness cause a more powerful physical reaction in us than Beauty’s orderly calm. Constable’s painting is balanced between these two aesthetic ideas. Ruskin also struggled with these two categories but both men eventually acknowledged the power of pure sublimity, Constable by embracing his own attraction to painting darkness and storms. Victorian England argued over the validity of religious authority and belief but nothing caused a lessening of the power of awe. J.M.W. Turner focused on the awesome energy in Nature itself when he went outside to paint in all kinds of weather. By 1830 Turner had broken utterly with showing the contrast of Nature and man that we see in de Loutherbourg and Constable above. Turner’s swirling painterly expressions of vastness, terror, and obscurity, portrayed Nature itself as Sublime. 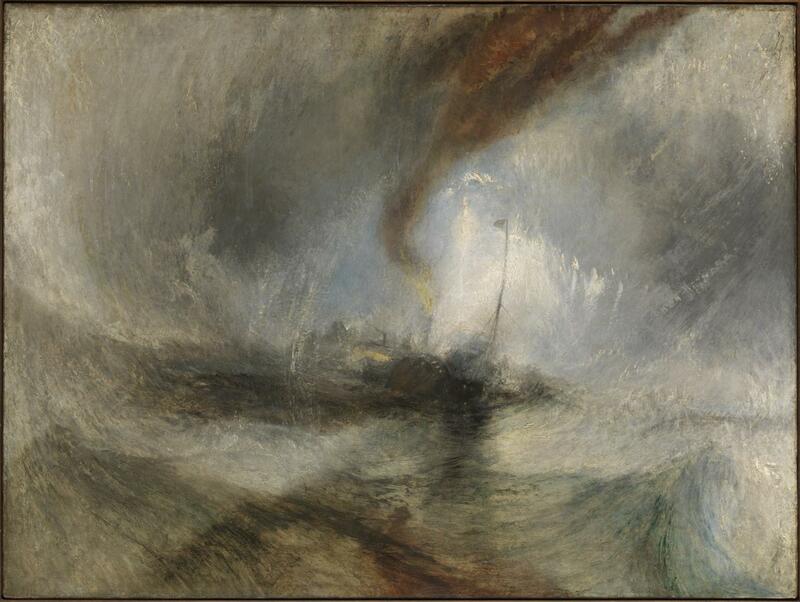 Snow Storm: Steamboat off a Harbour's Mouth by J. M. W. Turner. Exhibited 1842. Oil on canvas, 914 x 1219 mm. Courtesy of Tate Britain Accession no. N00530. (Accepted by the nation as part of the Turner Bequest 1856). Click on image to enlarge it. ​From Burnet to Turner, times changed pictorially just as they did in politics. In Europe, while revolutionaries and philosophers whittled away at traditional authority and built up a new idea of personal authority, subjectivity and individualism came to the fore and viewers of art were made to see things from a new standpoint. Throughout this evolution the idea of the Sublime thrived, there was always a need for it. In the life and thought of Edmund Burke himself (1729-1797) we see the Sublime affecting a practical-minded man. Burke was a politician not an artist, but his serious essays and popular speeches on the floor of Parliament show a European’s need for a thought-space away from the world that is “too much with us.” Born a British outsider in Ireland, as a member of the government he respected the aspirations of the American colonists, saying their right to self-government was supported by the English Constitution which he revered. But he famously opposed the French Revolution. French atheism, their claims of liberty and equality and rejection of the social hierarchy, plus reports of their violence so close to home turned him against the French “subverters.” What does this have to do with the Sublime? It is in the connection between his famous philosophical essay, Inquiry into the Sublime, written when he was only nineteen, and his Reflections on the Revolution in France when he was sixty. Burke loved the grandeur of human history. His anger at the Revolution was triggered by the French debasement of tradition, for Burke saw in the customs of any country what he loved in the Sublime: their vastness and power. He saw society as reforming perpetually from deep roots and was in awe of the past because it “embodies the collective experience of our forebears and more knowledge than any person or group could possibly gain in one lifetime” (Raeder). Burke believed that “the individual is foolish…but the species is wise.” This is a historical version of the Sublime. It is hard for a modern liberal to embrace Burke’s adoration of history because this has often been connected with brutal reactionary politics. But in both his philosophical writing and his letter against the Revolution, a sense for the Sublime is his bulwark against violent disruption and shows his dedication to links of continuity. The younger Burke explained that sublimity is signaled by a literal tightening in the body that has the power to block frivolity, whim and selfishness. His thinking was that since our primary drive is self-preservation, we are continually anxious about pain and danger, but the Sublime offers an escape. Inspired by the vastness of human history (or by an extraordinary scene), the mind can rest and fears can be balanced. The cure he prescribed for restless Englishmen—and this was much-discussed in Victorian times--was to contemplate the sublimity of the human past (even past terrors) in order to experience what ​Samuel JohnsonSamuel Johnson​​ ​called “that comprehension and expanse of thought which at once fills the whole mind, and of which the first effect is sudden astonishment, and the second rational admiration" (quoted in Landow​). Gordale Scar (A View of Gordale, in the Manor of East Malham in Craven, Yorkshire, the Property of Lord Ribblesdale) . James Ward. Exhibited 1815. Exhibited 1815. Oil on canvas, 3327 x 4216 mm. Tate Britain N01043. Click on image to enlarge it. The Deluge by Francis Danby ARA, 1793-1861. Oil on canvas, 2845 x 4521 mm. Exhibited 1840. Accession number: T01337. Presented by the Friends of the Tate Gallery 1971. Click on image to enlarge it. 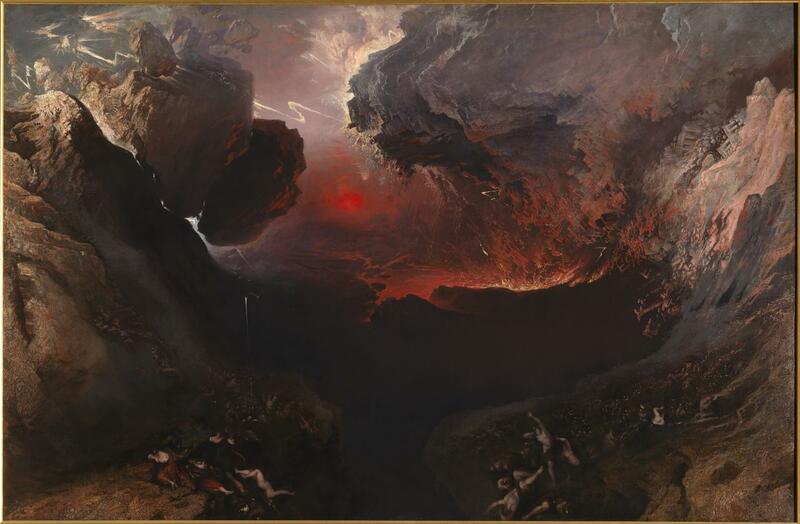 The Great Day of His Wrath by John Martin. 1851-53. Oil on canvas, 1965 x 3032 mm. Courtesy of Tate Britain. Accession no. N05613. Click on image to enlarge it. “life in all its restlessness, in all its pageantry, disappears in the magnitude and remoteness of the perspective. The mind sees only the gorgeous fabric of the universe”. If the pride of man is ever to be mocked, or his vanity mortified, or his selfishness rebuked, it is under the influence of these sublime studies [quoted in Smith]. Like tragedy, sublime ideas and images have us consider the pride and vanity of man interwoven in the fabric of the universe by awakening our fear of the two main threats to humanity, pain and danger. No wonder they have lasted so long. Capet, Antoine. “Art and the Sublime.” The Art Tribune. Web. Accessed March 2016. Raeder, Linda C. The Liberalism/Conservatism of Edmund Burke and F. A. Hayek: A Critical Comparison. Humanitas VX, No. 1, 1997. National Humanities Institute. Web. Accessed March, 2016. Smith, Allison. 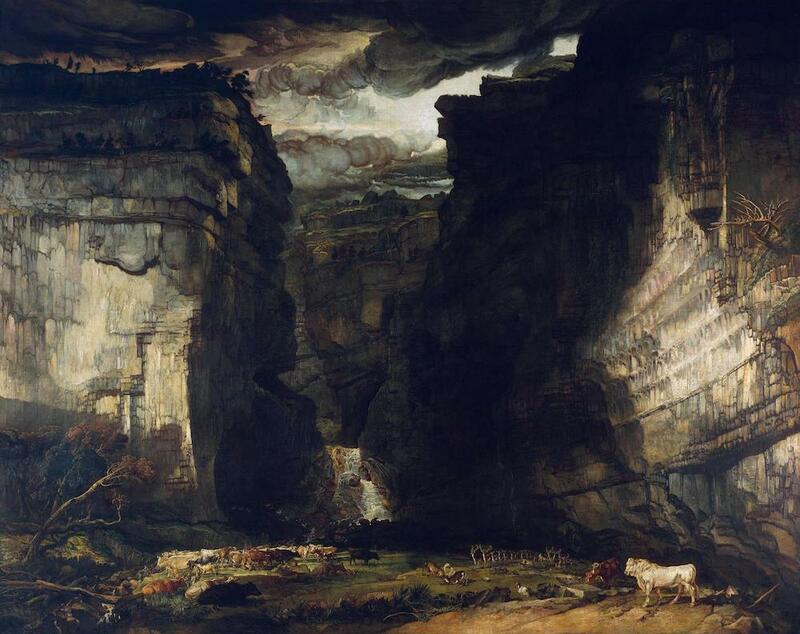 The Sublime in Crisis: Landscape Painting After Turner. The Art of the Sublime. Web. Accessed March 2016.